The main settings that will affect the overall look of a photo are aperture, ISO and shutter speed (yes I know there there are more, like your lens, white balance and blah blah blah, I get that... shut up nerd.) Today we are going to take a look at shutter speed and what I have learned so far about how it affects your photo. Shutter speed has two primary functions in a photograph; one is technical and the other is aesthetics. In the technical sense, the shutter will allow more or less light into a photograph. Your shutter speed determines how much light is allowed to hit the camera's sensor which helps create your desired exposure. The slower the shutter speed, the more light is allowed to hit the sensor. A faster shutter speed allows less light from hitting the sensor and creates more exposure of the image. In the aesthetics sense, a faster shutter speed will help capture an object in motion, while a slower shutter speed creates a blurred effect. 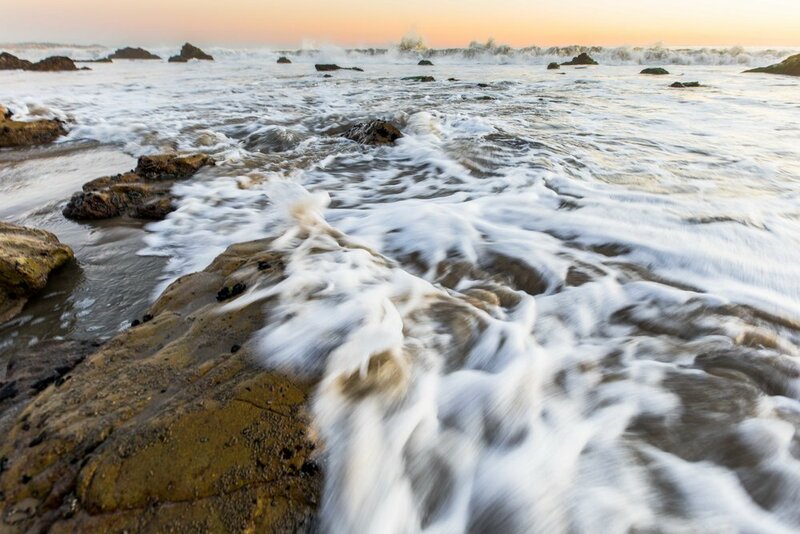 In the image above we have a 10 second exposure time that allows for the waves to appear blurred and wispy. A shot like this must be taken with a large/small aperture, on a tripod. The slightest bump of the camera can cause the entire image to be blurry. So how do we measure shutter speed? The shutter speed is measured as seconds, or a fraction of a second. A shutter speed of one second (1"), means the shutter allows in light for one second. 1/2" means it lets in light for a half a second, 1/400" means it lets in light for one four hundredth of a second. Often times you will see your camera display a whole number as its shutter speed such as 100 or 800. That is just the camera company's way of saying it's actually 1/100 or 1/800 of a second without having to try and display the "/". In this photo I used a shutter speed of 1/320. You will notice the tail rotor is still in full "motion" while the main rotor is almost stopped (because the tail rotor spins much faster). In addition a little bit of the ground and cars are blurry because the 1/320 wasn't quite fast enough to capture the motion of everything. I should have probably bumped this shutter speed up to 1/500 to get a crisper shot. Most high end cameras (Canon 5D series, Sony AII series, Nikon D850 etc) will have a shutter speed range of 1/8,000-30 seconds. Crop sensor or mid level cameras will have a shutter speed range of 1/4,000-30 seconds and lower end cameras will vary depending on their quality. (the iPhone 7 goes from 1/2000-1/3). Most cameras also have "bulb mode." At this mode the user can either manually open and close the shutter, or they can set a timer that is greater than 30 seconds for super long exposure shots. Each of the numbers below represent a full stop. The term "stop" in photography is when you either double or halve the amount of light in the photo. So a shutter speed of 1/250 will allow twice as much light as 1/500. On many cameras there are additional stops/shutter speeds like 1/50 or 1/40; that just means they are a fraction of a stop. 1/60- This tends to be the lowest setting for everyday handheld shots. Any slower than this and you risk having the image blurred due to the shaking in your body/hands. Here humans in slow motion are still relatively crips. Good for showing slight motion blur of humans running, cars driving etc. Remember when we said that each one of those numbers above will halve or double the amount of light that is allowed to hit the sensor? If we always shoot at a speed of 1/4000 or 1/8000 we may end up having a photo that is too dark. When we add or subtract light from the image via shutter speed, we have to compensate with either ISO, aperture or both to get the proper exposure. Both ISO and aperture can also make a photo brighter or darker, but when you change either setting it can also change the effect of the photo. So if you shoot indoors at 1/4000 you would need to either bump up your ISO or bring you aperture down below f/4 which would create a really shallow depth of field or add a lot of noise to the photo. The shutter speed for this photo is 1/250. Notice that the subject's feet are captured in freeze motion. In short, there is no "best" shutter speed to use. Different shutter speeds create different types of photos. Slower shutter speeds let in more light and can create motion or blur while higher shutter speeds let in less light and create less blur. If you're looking to learn more about shutter speed trying turning your camera's dial to "S" or "Tv". This will make shutter speed the priority for your camera. On this setting the camera will hold your desired shutter speed and adjust aperture and ISO to get the best photo. When I am shooting from a helicopter or moving platform I will put my camera on this setting and then set my shutter speed to 1/100 or higher. That way I know my photos wont be too affected by the motion of the helicopter or vehicle I am in. Practice shooting the camera on the shutter priority mode and adjust the shutter speeds as you take various shots. This will allow you to focus on learning one aspect of photography. If you'd like a good exercise, go out and find a fast moving stream of water or a waterfall. Set up the camera on the tripod, focused at the moving water. First, take a shot of the water at your camera's fastest shutter speed setting (1/4000 or 1/8000). Then reduce the shutter speed by one full stop (see the chart above) and view how the water changes as you slow down the shutter speed. Here I took the photo of this moving water at 1/30. You will notice at this speed the water is already fairly blurred. However, you will also notice the photo is slightly blurred overall. This is because I shot this photo by hand and my body and hand's movements were enough to create some blur in the photo. To combat this I could have increased the shutter speed to 1/60 and adjusted either the aperture or ISO to compensate for the loss of light, or I could have placed the camera on a tripod. At 1/60 the water would have been a lot less blurry. For this photo I used a slower shutter speed of four seconds. You will notice that both the waterfall and the water in the river are very wispy. 1-4 seconds is an ideal setting for getting this style of shot. This had to be taken on a tripod. At four seconds I also had to use a remote shutter because even pressing the shutter on the camera could have caused the image to become blurry. For this shot I used a very fast shutter speed of 1/4000. You will notice this captures the 40mm grenade coming out of the gun (yeah I know, wtf am I do doing shooting this sort of photo? It was for a tactical gear company.) Because the sun was setting there wasn't a whole lot of light to play with so I had to reduce the aperture to f/4 to let in a lot of light as well as bump up the ISO. The result is a very shallow depth of field and a lot of visible noise (that's the grainy stuff) in the photo. This shot was taken of the Northern Lights in Iceland. I used a 30 second shutter speed. You will notice at the bottom of the photo the car lights are continuous trails. Also, the Northern Lights are more of a blur of color rather than distinct light bands that you might see on other Northern Lights shots. Even with all the city lights and a full moon you can still see some stars at this setting. One important thing to know is what level you can take photos at while holding the camera in your hands. Above, I said 1/60 tends to be the slowest shutter speed you can have and still get crisp shots while holding the camera in your hands.... I kind of lied, sorry d-bag move. The reality is the more zoom your lens has, the faster your shutter speed should be to get a crisp shot. This is because a magnified lens will exaggerate movement. Imagine you are looking through a set of binoculars, you always have to hold them very still because every slight movement creates motion blur. This transfers to zoom lenses. As a good rule of thumb you shouldn't drop below your lens' focal length in shutter speed. For instance, if you're using a 50mm lens, you shouldn't go below 1/50 seconds if you're holding it with your hand. If you have a 70-200mm lens, don't drop it below 1/60-1/80. If you have a 400mm lens you will want to run a fast shutter speed of 1/400. One thing that will change the above rule is if you have a built in stabilization to your camera/lens. These are designed to reduce your body/hand's vibrations of the camera and lens. Well, that's all I know for now, I will update this post as I learn more!